It pays to register early. 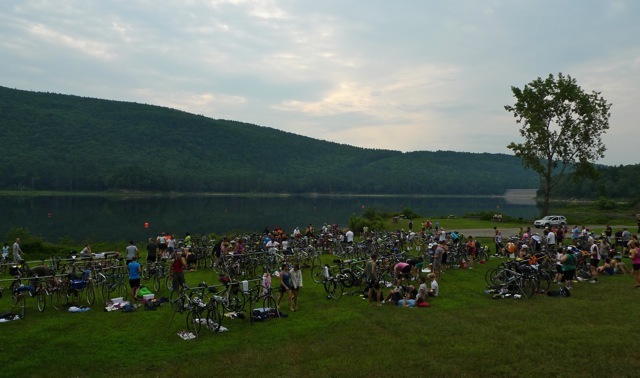 On Saturday, July 14th, Masher McBuns did the 7th annual Give Peace A Tri, a local sprint triathlon at Surry Mountain Lake in Surry, NH. He's been training pretty consistently as you can see from these previous training pics, and was super super excited to race! The best, best, BEST part about this race was that he registered two seconds after the race director announced that registration was open, and the result? He got the first bib number! So no matter how he performed, he'd be number 1! After checking in and picking up his bib number, timing chip and race t-shirt, Masher headed over to the pretty full bike racks to set up his transition area. Bike - in easy gear since the mount and bike course start on an uphill, check. Spare tube, tire levers, CO2 cartridge, adapter, all in under seat bag, check. Water bottle - hydration on the ride is important. Check. Black silicone bread pan with clean water - check. What, what?! Why a bread pan? Pro tip: Masher will dunk his paws in before slipping on his bike shoes. That way all the sand, rocks, grass and other stuff he's collected on his feet from running out of the water and across the transition area will be nice and clean, ready to slip into shoes. Silicone is nice and soft and squishy, so there's no risk to others in tripping/breaking/cutting. Plus, it's lightweight and packs up easily. If your feet are bigger than a bread pan, well, Masher can't help you. Maybe you'll need a silicone cake pan. Beloved Ruffles Chip towel - to wipe feet, and mark transition territory, check. 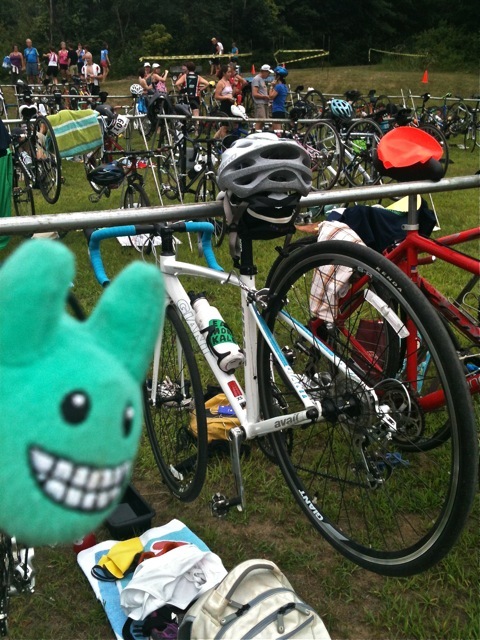 Swim cap and goggles - mandatory, labbits hate getting their ears wet. Check. Bike shoes - the better to clip into the bike pedals with. Check. 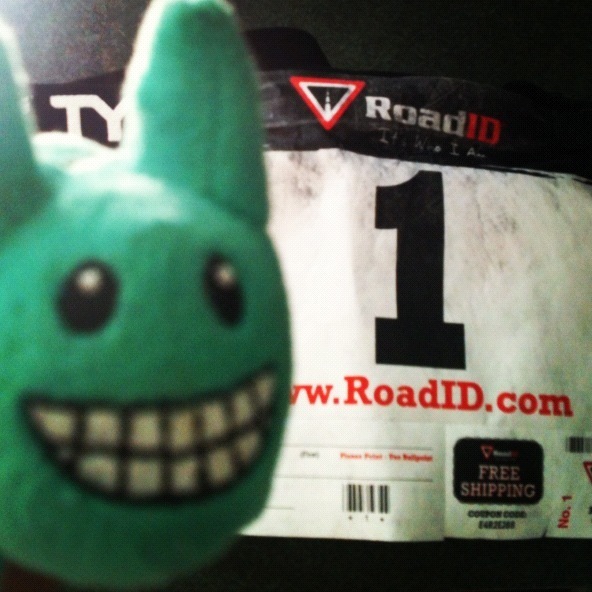 Race belt with bib number secured - so people can cheer him on, GO NUMBER 1!! Check! The buoys are in place! 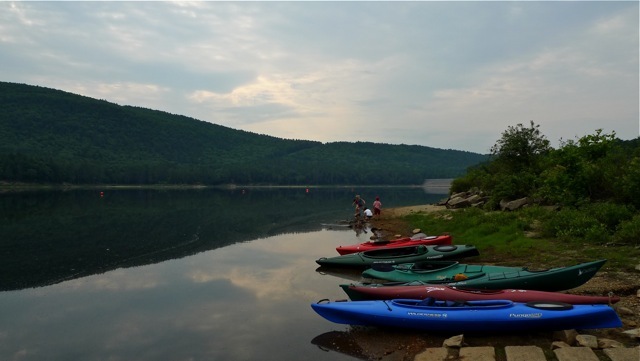 The kayaks are ready at the boat launch, where volunteers in kayaks will provide assistance to those who need a breather, or those who cramp up, freak out, and otherwise need to be helped back to shore. 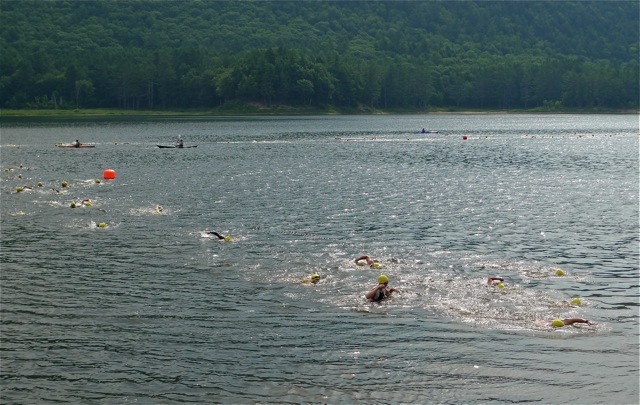 Masher's done some OWS (Open Water Swim) practices, but never had the chance to swim with 200+ racers, so he plans on taking it easy, swimming to the back and outside so he doesn't get swum over. 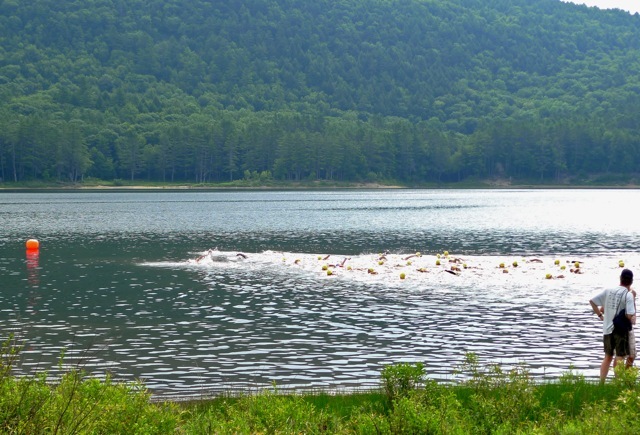 Yes, people get swum over in triathlons. Masher's a little nuts to be doing this sport. On the plus side, the lake water is like glass! That will change once the "washing machine" starts up (everyone gets in and churns the water), but it's better than facing lots of chop and wicked rip tides! Masher took a quick warm up dip to test the waters (warm!) and joined in on the pre-race info session/pep-talk. He couldn't believe there were people in wetsuits. The water was warm...Masher knows, he's got fur! Being in a wetsuit could easily overheat a person, but it does help people float, which in turn helps people swim faster, so Masher figures they wanted every advantage. And bonus - the two in the wetsuits in the foreground have pretty inspiring pace booty. The pre-race talk involved last minute course changes, due to recent flood damage. Masher's not too good at listening to long instructions. He got lost after the first "right out of the back of the park, then left on blurblefart road". He's gonna have to rely on the volunteers to point him the right way. So with that, it was into the water for his swim wave! There he is! In the yellow cap! Can't find him? He's easier to see in the next picture. 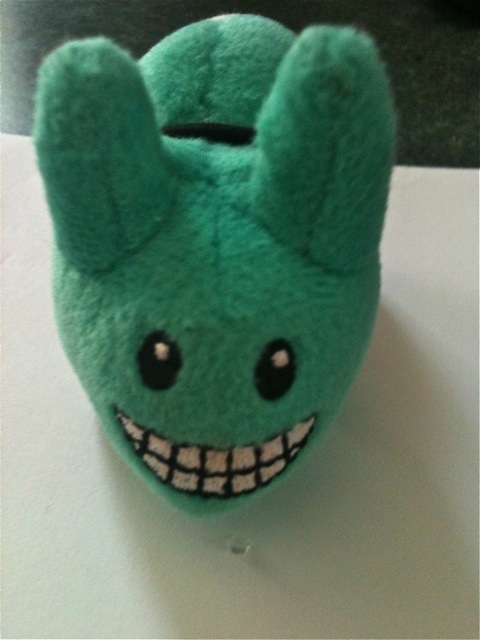 Look for the labbit in the yellow cap. The swim went well. He didn't drown (yay!) despite a few kicks to the head and hands and feet knocking him around. Triathlon is a full contact sport. Transition was easy. Dunk into the bread pan, goggles and cap off, helmet on, bike shoes on, race belt on, GO! Masher made sure to thank all the volunteers he passed, who cheered for him and pointed him in the right direction. Without the volunteers, it'd be easy to take a wrong turn, or to keep going and not remember to turn. Race volunteers are often at the event longer than the athletes, so Masher makes a point to show his gratitude. Without volunteers, races wouldn't run well at all. The ride went really well...it's the one leg Masher knows he can really push it. Unfortunately, he took the last corner really fast, maybe cutting it close on the inside where the road tends to collect a lot of gravel, garbage and junk. It was there, a third of a mile from the dismount line, that Masher had a flat tire. Flat tires are no fun. But that's why you pack a flat kit in your under seat bag, and Masher had made sure it was there when he set up in transition. 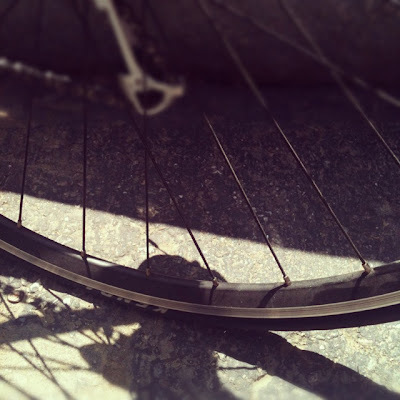 He even practiced changing a flat the night before, to make sure his skills were sharp. But...he was only 1/3 mile from the bike dismount line. He hustled along with the bike, wondering if he should stop and change the flat, or keep running with the bike. A rider came by, asking if he was ok. Masher explained the flat, and as the racer whizzed by, he said, "you're almost to the dismount!" And so, Masher decided it would take about as much time to run it as it would to change the flat. He ran it. The flat may have cost him 6 or 7 minutes (it's really awkward running after you've been biking hard, and even harder when you have to pull a bike alongside you for 1/3 of a mile), but when he approached the dismount, he realized people were having as much difficulty dismounting the bikes on a downhill, as they did mounting the bikes on the uphill. He stayed to the right of the traffic jam of racers (unfortunately some people dropped their bikes or fell) and ran through the chute to the transition area. He racked his bike (he's not too fond of people who just dump their bikes, especially if it's on someone else's stuff!) slipped out of his shoes and took off running...well, okay, he actually forgot the race director's instructions and didn't know which way the run started, and there were so many non-racers in the transition area and cheering around the chute he got confused and kind of stood around for a moment. Then he saw a girl with a race number running off to the park entrance and made the quick decision to follow her, hoping she wasn't heading to her car or the rest room or the finish line, where tables of cookies, pizza, and fresh berries were waiting. The run was the worst leg. The swim had been fun, even with someone's feet kicking Masher in the face, the bike had been Masher's fastest...until the flat...and that was ALL he could think about. The other problem was that the clouds had cleared, and Masher was running in full sun, and it was heating up. Labbit fur gets pretty hot, as you can imagine, and Masher's not too fond of running under full sun. The biggest problem, however, was that Masher, in all his pre-race intel sessions, had never actually practiced - or looked at - the run course. He had no idea where the turns were, how each mile would look, and there were no mile markers on the course. The volunteers were there to point him in the right direction, but he lost sense of pacing, and was all gloomy over the flat tire. He didn't run his best, but...he did finish, and that's what counts! WAY TO GO MASHER! All things considered, he had planned on finishing in 1 hour, 15 minutes, and considering the flat tire fiasco, he would have finished in 1 hour 10 minutes. Ah, next time, Masher! You still did great! At the end of the race, Masher helped himself to some water, a big ol' slice of Ramunto's spinach pizza, a bunch of blueberries and peaches, and somehow he missed the cookies, which is too bad because he signed up mostly for the cookies. After some stretching and watching some more racers come in, Masher collected his things and checked out the tire. Yup totally flat, and he found the culprit, this piece of glass. Race staff and volunteers do their best to sweep up the corners before a race, but little bits like this can get left behind. He must have hit the glass in the right way that it punctured his tire and tube. He feels he made the right decision to keep going and run the bike back. Good thing it was only a 1/3 mile. Only forward. 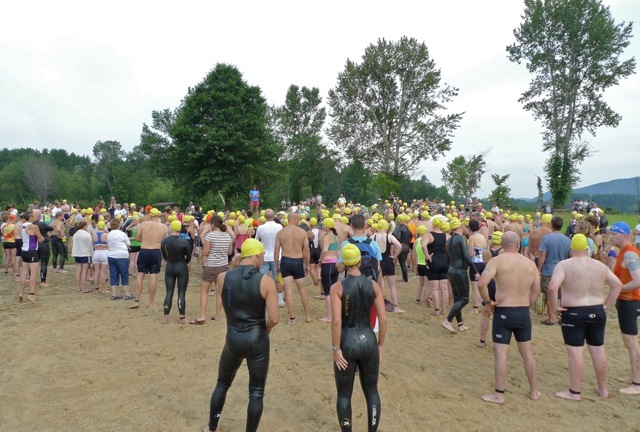 Masher promises to kill it at his next race - the Wallis Sands Tri in Portsmouth, NH!